PTO - is needed for the transmission of full power with the dependent drive. With HMS off with the tractor stop stops the rotation of its output shaft. 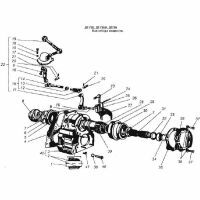 With simultaneous tripping of the two planetary rear axle brake mechanisms (for a short time) of rotation of the output shaft and the PTO power transmission it does not stop. In the BOM for a long parking lever CPR should be set to the neutral position and the pedal stopping brake is put on the latch. PTO nothing more than a gear with a single step and with interchangeable spur gears mounted in a housing of cast iron, and have a cavity for oil, which communicates with the rear axle housing. At the bottom it has a mounting hatch covered tray. Pinion stands on ball and roller bearings. Inside the gear have splines, which include the slotted end of the drive shaft. The drive shaft extends through the rear axle and front splined end belongs to the splined bore of the primary shaft CAT. For tractors manned HUM or reverse gear, a driving shaft PTO goes through the rear axle, the hollow inside shaft CPR and the front splined the end part of the slotted hole capstan Humana and reverse gear. creeper (HUM) tractor DT-75 is a 4-step reduction gear, mounted in a separate casing between the CAT and clutch. It is included together with 1, 2, 3, and 4th gears resulting in a reduced tractor velocity.